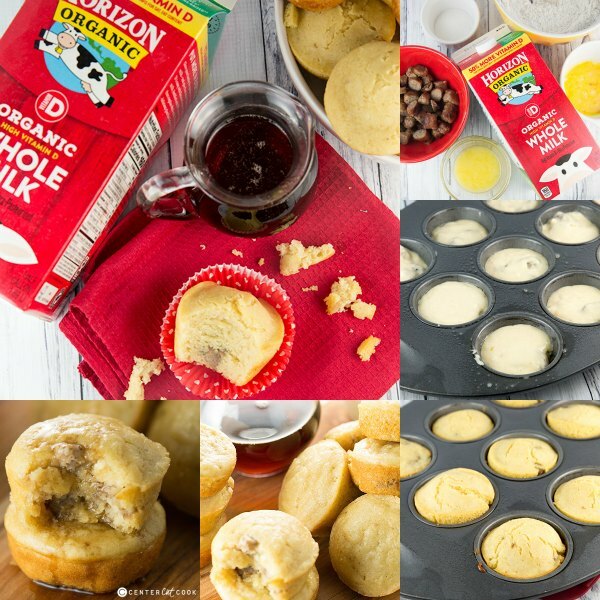 Easy Baked Pancake Muffins define breakfast made easy. Made from scratch and the perfect grab and go breakfast, you can choose a variety of mix-ins from breakfast sausage to fresh berries. 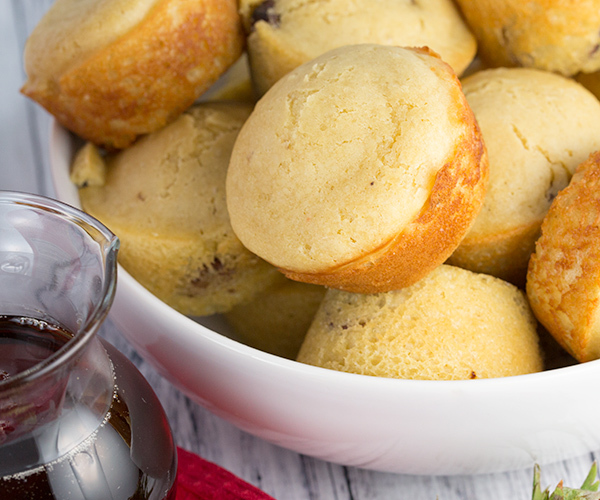 Pancake Muffins re-heat well and are perfect for lazy weekends or hectic mornings. There’s something to be said about an easy breakfast recipe that doubles as both the perfect solution for a lazy weekend breakfast and a grab and go breakfast for busy weekdays. It is everything you love about the convenience of a muffin, but it’s really a pancake. You can’t go wrong with either, right? Both pancakes and muffins are delicious but you are going to love this recipe for Easy Baked Pancake Muffins. If you want breakfast made easy, look no further. 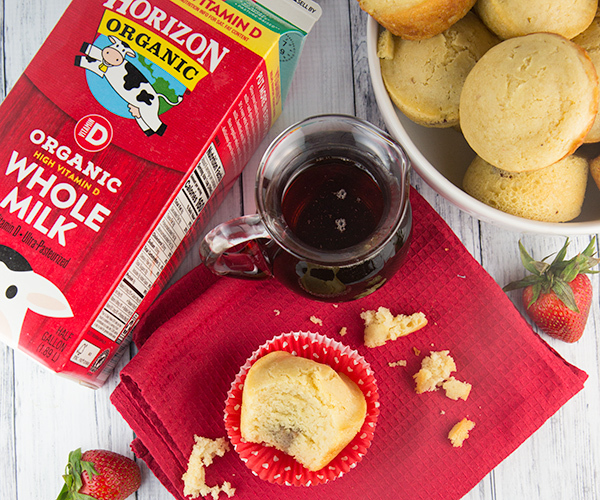 These Pancake Muffins can be made with just about any mix-ins that you’d like. I made them with cooked and chopped breakfast sausage (ground sausage or sausage links), but I’ve also made them with blueberries, strawberries and cinnamon sugar. 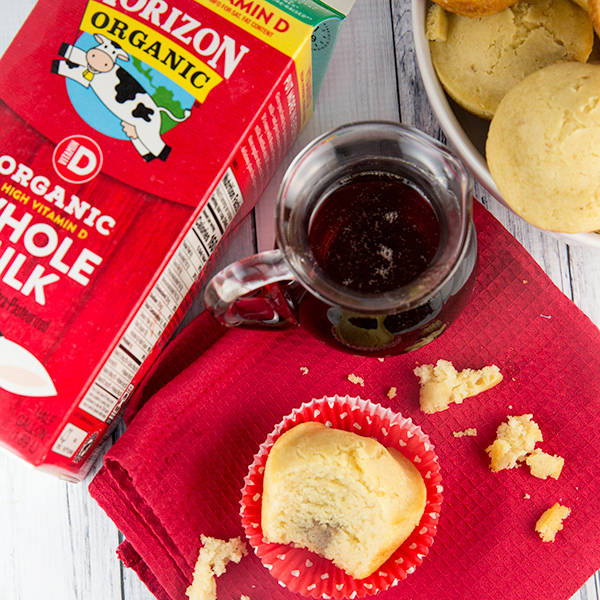 The options are endless for both savory and sweet pancake muffins. Sometimes in the midst of parenting chaos you just need a simple and easy recipe that you know everyone will love. Pancake Muffins are such a fun way to eat breakfast too. 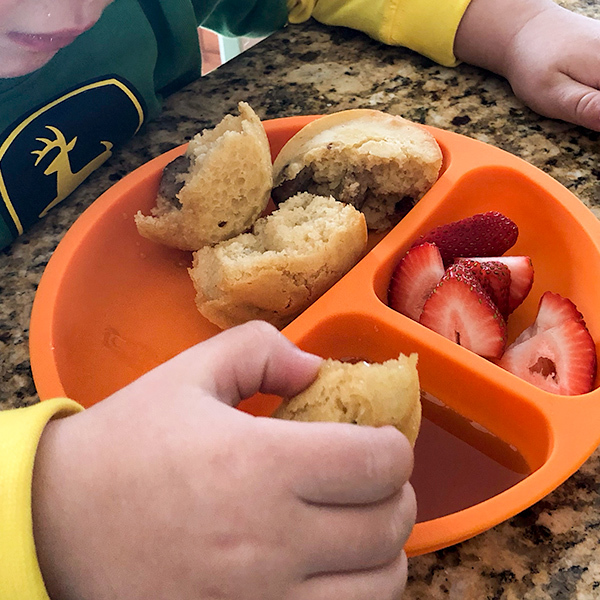 My three year old thinks that any food he eats is instantly better if he can dip it in something, so these pancake muffins are perfect dipped in real maple syrup. I put syrup in a little cup for him to dip these cute muffins and slice up some strawberries on the side and it turns out to be the perfect breakfast. Pancake muffins are best made from scratch and thankfully they are fast and easy and the recipe comes together in less than 10 minutes with about 15 minutes to bake. They freeze well too so make a double batch and have extras for another day. The ingredients for these muffins are all pantry staples. Start with Horizon Organic Milk and combine it with a bit of white vinegar. I used Horizon Organic Whole Milk but any variety of Horizon Organic milk will work. You will also need all-purpose flour, a bit of sugar, baking powder, baking soda, salt, eggs, butter, vanilla, and of course, real maple syrup for drizzling. 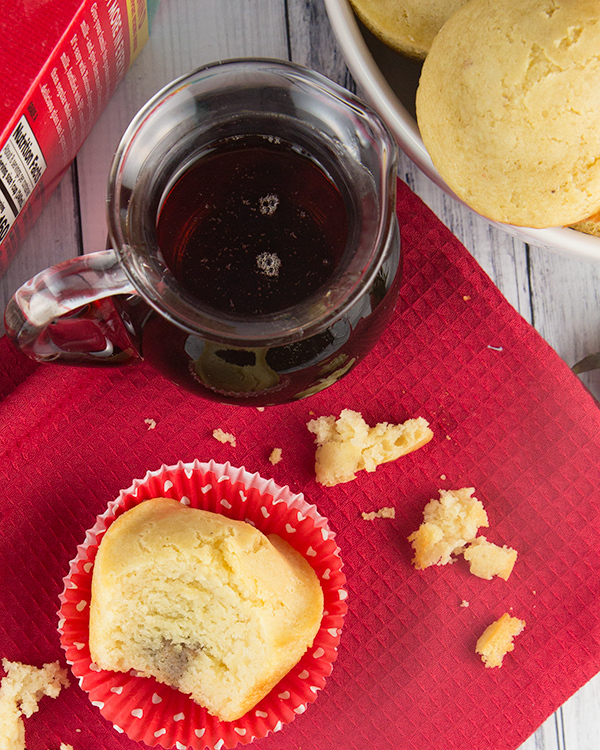 It’s okay if your pancake muffins don’t look perfect, they’ll taste delicious no matter what. That’s the beauty of this recipe – it’s quick, easy, and delicious. Cook breakfast sausage and cut into small pieces. In a small bowl combine Horizon Organic Milk with vinegar and allow it to sit for 5 minutes. Add in eggs, Horizon Organic Milk, vanilla and melted butter and stir to combine. Stir in cooked breakfast sausage pieces. Prepare muffin tins with non-stick cooking spray or line them with paper liners. 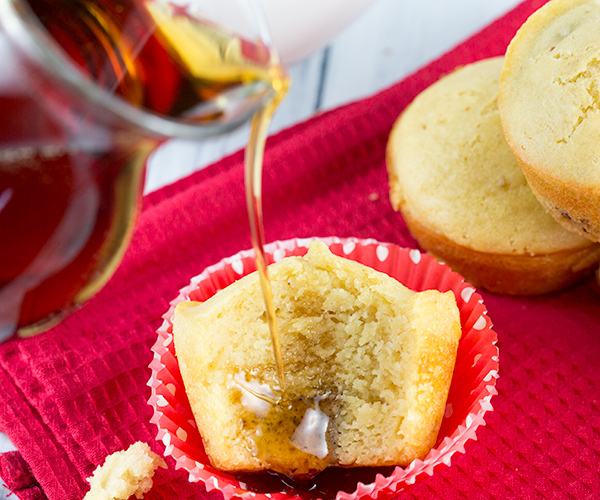 Drizzle pancake muffins with maple syrup and serve immediately.